Describe the strategic change context in 2002, at the start of the change process at Faslane. You should apply Balogun and hope Hailey’s change Kaleidoscope and discuss your findings. You should also briefly describe the type of change (use Balogun and hope Hailey’s type of changes model). You may additionally use any other relevant academic reading to develop and support your ideas. 1.1 Balogun and hope Hailey’s change Kaleidoscope. 2. Compare and contrast the internal features of the organizational when it was run by the MOD and Royal Navy (Up to 2001) with when it was run by Babcock Marine (2002-2010). You should apply McKinsey’s Seven S framework (do this twice – once for ‘up to 2001’ and once for 2002-2010) and discuss your findings. What, for example, where the most significant differences? You may additionally use any other relevant academic readings to develop and support your ideas. 3.Critically evaluate the Faslane change using Kotter’s change steps. The main aim of this paper is to focus on the strategic changes at Faslane from different perspectives of the Babcock marines and the Ministry of Defense (MOD). The objective is to understand the change and the studies of strategic leadership. Taking into consideration a number of different theories and models to analyze internal and external influences of the organization. In the year 2002 Faslane which was previously managed jointly by the Ministry of Defense and the Royal Navy decided to partner with Babcock Marine, a private sector company. The main aim of such partnering agreement was for the purpose of reducing cost and improving their services. Babcock Marine was given the responsibility to save the cost as well as to improve their operational effectiveness. They were given a target of £76 million saving within five years. With a significant change Faslane was able to achieve the target and was considered best. Change Kaleidoscope was produced by Hope Hailey & Balogun (2002) to be a method for pulling together and arranging the extensive variety of logical highlights and usage choices that require thought amid change. In this sense Change kaleidoscope is even more a model than a strategy, however it is usable instrument for conceptualizing the way of progress. By its plan, the model speaks to an exhaustive system which manages the greater part of the variables that the creators regarded noteworthy by the writing. The kaleidoscope model was utilized interestingly to reflectively investigate a change project embraced in a first pharmaceutical organization. 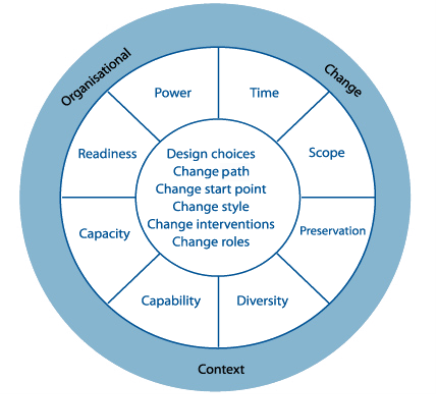 The kaleidoscope contains an external ring which is concerned with the highlights of the change setting that can either empower or oblige change, and an inward ring that contains the menu of usage choices open to change specialists. Comprehension of the context oriented highlights empowers change specialists to judge the fittingness of any methodology for their specific setting. The outer ring relays to the broader strategic adjustment context. The central ring relays to specific contextual issues that need to be considered when expressing a revolution plan. The internal circle gives a set of choices of selections and interferences, design selections obtainable to change. Time -How rapidly is change required? Is the association in emergency or is it concerned with longer-term vital improvement? Scope -What degree of change is needed? Does the change affect the whole organization or only part of it? Preservation -What authoritative resources, attributes and practices need to be kept up and secured amid change? Diversity -Are the diverse staff, expert gatherings and divisions inside the association generally homogeneous or more various as far as qualities, standards and disposition? Capability -What is the level of authoritative, administrative and individual capacity to execute change? Is there a need to enhance this ability before the change methodology can be begun? Capacity -How much asset can orgnaisation INVEST in the proposed change as far as money, individuals and time? Readiness for change – How prepared for change are the representatives inside the association? Is it accurate to say that they are both mindful of the requirement for change and roused to convey changes? Power -Where is the force vested inside the association? What amount of scope of carefulness does the unit expecting to change and the change pioneer have? Change is required moderately snappy. There is no feeling of earnestness as the association is not in an emergency. It is more concerned with long haul key advancement. The change will influence the entire association as the progressive structure has been customized and the authoritative structure has been compacted. The management group has been split and the money related division has sparing targets. General the change is transnational. The association is ring fenced from radical changes, lessening the danger of a potential emergency. The different scope of individuals inside the association makes a pool of aptitude sets and creative change thoughts. The management group has been split from 250 individuals. This may bring about one of two things the three won’t be sufficient administrative ability to execute changes or the straightened structure will expand effectiveness. However there appears to be adequate competence to launch change. The inquiry is whether they can convey change as there are sentiments of common advantage. Outside linkages, for example, individuals from Babcock, systems with TRADE unions and different organizations who experienced comparative changes. The firm has conveyed a diminishment of 20% in yearly running expenses. In the second year, the firm has actualized execution scorecards and other measure yields. The blended administration group accepted change was important; however those contradicted to banding together were liable to be denied and less promising. The workforce appeared to be frightful what change would mean. The workforce has restricted independence however the change pioneer is empowering straightforwardness and permitting representatives to express their assessments .Objectives are adjusted and the business planning is top down. However the representatives have the ability to oppose change as already transformational change has fizzled in the past. The McKinsey’s Seven S structure grew by well-known business specialist Robert H Waterman & Tom Peters in 1980. McKinsey’s Seven S system is an administration model which incorporate Strategy, Structure, Systems, staff, style and style. McKinsey’s Seven S structure is habitually utilized as an Organizational examination instrument to quantify and screen changes in the inward state of an association. • Examine the execution of an organization. • To close how best to actualize arranged technique. Strategy – The plan formulated to continue and build competitive benefit over the competition. Over-all, strategy is the one that’s obviously expressed, is long-term, helps to grasp competitive benefit and is reinforced by sturdy vision, mission and values. Structure – Strategy signifies the way business divisions and units are planned and contains the data of who is responsible to whom. In other words, structure is the organizational map of the firm. It is also one of the most noticeable and easy to change fundamentals of the framework. Systems – Systems are the methods and actions of the organization, which expose business’ regular happenings and how choices are made. Systems are the zone of the firm that concludes how business is done and it would be the main attention for managers through organizational adjustment. 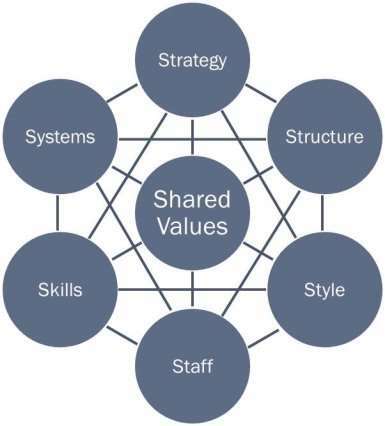 Shared values – Share values can be highlighted as the core of McKinsey’s Seven S framework. Shared values are generating an organization that admirations each and every worker, committed to the environment and constantly attempts for waste elimination and perfection in everything it does. Skills – Skills are the capabilities that firm’s workers accomplish very well. They also contain competences and capabilities. During administrative conversion the question often rises of what skills the company will really necessity to strengthen its fresh strategy or different construction. Staff – The general meaning of staff is the employees and their general competences. Staff component is apprehensive with what type or how many workers an organization will require and how they will be employed, educated, encouraged and satisfied. Style – Style signifies the way the company is control by top managers and how they intermingle, what movements do they take and their representative value. In addition style is the administration style of company’s leaders. Time intensive in choice making. Problems in taking care of client grumblings and late adaption to change. Unfamiliar with present day MANAGEMENT styles and change process. More than 1700 common administration staffs were occupied with Faslane. Not prepared for change. Concentrated more on framework and offices than individuals. Ethnocentric convictions and imperviousness to change. Expense sparing and great quality administrations. Cost sparing may prompt low quality of administrations. Structure is formal yet every individual have the capacity to frame group and can display BUSINESS PLANS. Layers of management lessened to 4 from 7. Unnecessary opportunity may harm the chain of command of the association. Change the outlook of individuals. Issues in taking care of client dissentions. The greater part of the staffs have experience of progress. Unfamiliar with the operation of maritime base. Pioneers are knowledgeable about change process. There are dangers connected with the change transform in such industry. More than 2000 common administration staffs were occupied with Faslane. Staffs are concentrated more on individuals than base and offices. Lessening the administration layers implies loss of employment and it may not rouse staffs to work viably. More profit which may hamper its strategy. Critically evaluate the Faslane change using Kotter’s change steps. Faslane needed prompt change so Babcock assumed control over the administration framework and continue for change. They need to decrease cost and enhance operation proficiency without influencing administrations to Navy. They urge staffs to impart thoughts and insight additionally give energy to make own gathering and arrangement for division. They lessens administration layer to 4. They make focus to attain to 76 million of expense sparing in 5 years period without influencing the administrations gave to the Navy. They help and bolster representatives to embrace the change process. Babcock Marine decrease administration layer to 4and make association structure straightforward. They completely bolster representative for change and make a point to accomplish the association objective. They decrease political interference and administration layer. They likewise evacuate the trepidation of representatives for change process. Experience workers for change methodology were brought so that other existing representatives of Faslane will embrace change rapidly. They effectively actualize change in low level and change impression of worker that change methodology is for good. They enhance execution and quality in administrations. They additionally break their 5 years plan and make yearly target which was to attain to 3 million however they had the capacity accomplish 14 million. Babcock Marine discover positive change after lessen in worker view of apprehension and administration layer. New administration style was ideal to accomplish the focus of association. The new administration and administration for Faslane was accomplishment to meet target. They enhance the quality and administrations for client. Thus, Faslane got opportunity to oversee whole UK’s submarine armada. Faslane was in requirement for quick change, so in 2002 they cooperate with Babcock Marine with understanding of acquiring positive change entire association. They have an arrangement to attain to £76 million of expense sparing in five years of period without influencing the administrations gave to the Navy. Meanwhile for accomplishing their targets they apply distinctive expected and new technique according to needed. Change was not simple for Babcock in light of the fact that at first the client was not to support them. So to change individuals’ outlook Babcock begin to spurring for change as their acquiring was taking into account the sparing of the expense. Babcock urges to impart new thoughts and insight through entire day exchange. Babcock was knowledgeable about change process they knew the things need to decrease and enhanced in Faslane. They reengineer the structure of an association. By decreasing the administration layer from 7 to 4 they were accomplishment to decrease cost and enhanced operational adequacy without influencing in nature of administrations. They concentrate on straightforward correspondence through and through level of administration. They decrease around 400 full-time equal posts. The contextual analysis demonstrated that particularly amid times of progress a trade of expertise is indispensable. This exchange must happen in the middle of new and experienced workers, generalists and experts, et cetera. Likewise, it got to be clear that cost decreases and administration upgrades are conceivable in the meantime. What is required is a reasonable objective (key pioneer’s obligation), a certain independence for representatives (constrained self-rule is liable to be ineffectual because of long choice making techniques) and the incorporation of every single influenced partner in the change process (clients, workers, nearby group, and so forth if there should be an occurrence of Faslane). Faslane has possessed the capacity to consent to all the five components of Successful and viable key authority. It had the capacity impart association’s motivation to all the partners. It was additionally fruitful in keeping up moral standard and overseeing HUMAN RESOURCES. With its great execution, it had the capacity meet its target and had the capacity deal with the whole UK submarines armada. Proof for this administration style being successful can be seen in the choice that Faslane would turn into the home base for atomic submarines as well as for the whole UK submarines armada which means up to 2000 more JOBS. Faslane was extremely intriguing contextual investigation and considered associations MANAGEMENT and by what method can shrewd changes influence everything. A. Franken, C. Edward, and R. Lambert, ‘Executing Strategic Change’, California Management Review, (2009), pp. 49-71. Johnson, Gerry, and Kevan Scholes. Exploring Corporate Strategy. London: Prentice Hall Europe, 1999. Print. Johnson, Gerry et al. Integrated Business Applications. Frenchs Forest, N.S.W. : Pearson Australia, 2013. Print. Kotter, and Kotter International. 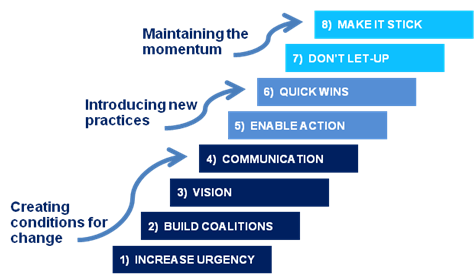 ‘The 8-Step Process for Leading Change – Kotter International’. Kotter International. N.p., 2015. Web. 3 Apr. 2015. Kotterinternatinal . 2014. The 8-Step Process for Leading Change. [ONLINE] Available at: http://www.kotterinternational.com/the-8-step-process-for-leading-change/. [Accessed 22 April 15]. Ambrosini, VeÌronique, Gerry Johnson, and Kevan Scholes. Exploring Techniques Of Analysis And Evaluation In Strategic Management. London: Prentice Hall Europe, 1998. Print. "The change kaleidoscope." UKEssays.com. 11 2018. All Answers Ltd. 04 2019 <https://www.ukessays.com/essays/linguistics/the-change-kaleidoscope.php?vref=1>. "The change kaleidoscope." All Answers Ltd. ukessays.com, November 2018. Web. 23 April 2019. <https://www.ukessays.com/essays/linguistics/the-change-kaleidoscope.php?vref=1>. UKEssays. November 2018. The change kaleidoscope. [online]. Available from: https://www.ukessays.com/essays/linguistics/the-change-kaleidoscope.php?vref=1 [Accessed 23 April 2019]. UKEssays. The change kaleidoscope [Internet]. November 2018. [Accessed 23 April 2019]; Available from: https://www.ukessays.com/essays/linguistics/the-change-kaleidoscope.php?vref=1.